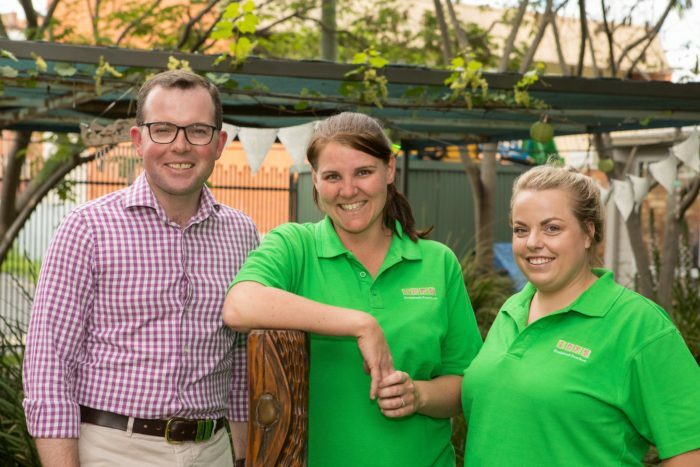 Northern Tablelands MP Adam Marshall, left, with Inverell Kindimindi Preschool educators and NSW Rural and Remote Early Childhood Teaching Scholarship recipients Marie Teakle and Amy McPhee. THEY’RE early childhood educators and mums to boot but two Inverell women are excited to be taking on even more of a workload next year with scholarships to study for their teaching degrees, Northern Tablelands MP Adam Marshall announce today. Mr Marshall said local Kindimindi Preschool educators Amy McPhee and Marie Teakle had been awarded two State Government scholarships worth up to $10,000 each to gain their bachelors degree in early childhood and primary education. “Amy and Marie are great educators and these scholarships will give them a helping hand in upgrading their qualifications and I think it’s a real credit to Kindamindi that they’ve seen two of their six staff successful in capturing these honours,” Mr Marshall said. Mr Marshall said the Rural and Remote Early Childhood Teaching Scholarship program assisted diploma-qualified educators currently working in community preschools and long day care services in rural and remote areas of the state to upgrade their qualifications to bachelor degrees. “The scholarships will assist Amy and Marie with the cost of their study with texts, technology, travel and fees,” Mr Marshall said. Kindamindi Preschool Director Jan Carr congratulated the two and said the preschool was very excited at the news. “It’s just beautiful and just nice that educators like Marie and Amy want to upskill, they are so dedicated and committed and I’m super pleased for them and for us, that we’ve got such awesome educators,” Ms Carr said. She said Kindamindi was an institution with a proud pedigree in pre-school education in Inverell, with 48 placements a day of three to five year olds. Amy began her career in childhood eight years ago at Kindamindi as an 18-year-old, fresh out of school. “I was working for a fast food chain but always wanted to do childcare but back then I didn’t get the scores, but I got a traineeship at Kindamindi to study,” Mrs McPhee said. She gained her Certificate III and then Diploma in early childhood and from March next year will undertake her bachelor degree through online study at the University of New England (UNE). “I recently got married and I have two children, a four year old and a one-year old, so I will have a lot on my plate but I love study and interacting in this environment,” Mrs McPhee said. Her colleague Marie Teakle is in the same motherhood mould, she’s engaged to be married, has a six year old, a two year old, and planning for baby number three in March – just as she undertakes her new study online through UNE as well. “No, no I’m not planning on getting married next year; that would be just too much on my plate,” Miss Teakle said. Marie said early childhood education had been a passion of hers since she was at school, she’d completed her diploma in it at college and had been in the industry for 12 years. Mr Marshall has congratulated the two and wished them all the success they deserved. He said the fact that UNE provided online degree courses meant students like Amy and Marie were more able to fit study around work and family commitments.